Sometimes a medication prescribed by a doctor is so unique and individualized, the medication isn’t commercially available. That’s where compounding comes in. A compound is prescribed medication we are able to make in our lab, to exact specifications. We specialize in the art of compounding. Here’s another way to look at it: "One size does not fit all," and we are able to prepare medications to fit the strength, dose, and administration route that best suits a patient. Q: Your pharmacy can fill compound prescriptions. Are you also able to fill other, traditional prescriptions? Yes. We are a full-service pharmacy, so we can fill any prescription you need. Q: Do compounds take longer to fill than regular, traditional prescriptions? Yes. Because compounds are specially-made, they take longer. Wait times vary from 15 minutes to 48 hours, depending on the medication. Q: Does insurance cover compounds? Whether or not your compound prescription is covered by your insurance depends on your plan. Approximately 50% of insurance plans cover compounds. We are able to bill your insurance for compounds at the time you fill, and can tell you 1) if your plans covers the compound and 2) what portion (how much) they cover. If your plan does not cover the compound, we make every effort to ensure affordable access to the medication you need. Q: What administration routes are possible with compounding? While conferring with physicians, we evaluate what administration route is most convenient, while still maintaining a high level of efficacy. Forms include capsules, lollipops, creams, ointments, lozenges, gels, liquids, suppositories, and rapid dissolve tablets. Q: So you can compound medication in different forms. What about if I have an allergy issue? As a compounding pharmacy, we can make allergy-friendly medication for any patient with issues involving lactose, preservatives, dyes, gluten, or sugar. Q: What other issues can compounding ease? Patients who may struggle with taking their medication due to difficulty swallowing, sensitivity to taste, or trouble cooperating take comfort in our ability to compound. Patients in this category include young children, elderly patients, and even pets. Q: What specialties do your compound services include? For example, if a physician or veterinarian needs to prescribe a medication in a form or strength other than what’s commercially available, our pharmacists know how to make everything from food-flavored suspensions for canines and felines, to T3-T4 capsules to aid thyroid function in men and women. Our pharmacists and staff work every day with physicians across the state to help patients feel their best. The Jolley name has been recognized and trusted to provide quality care in traditional and compounded medications for over 50 years. We are proud to be a member of PCCA. 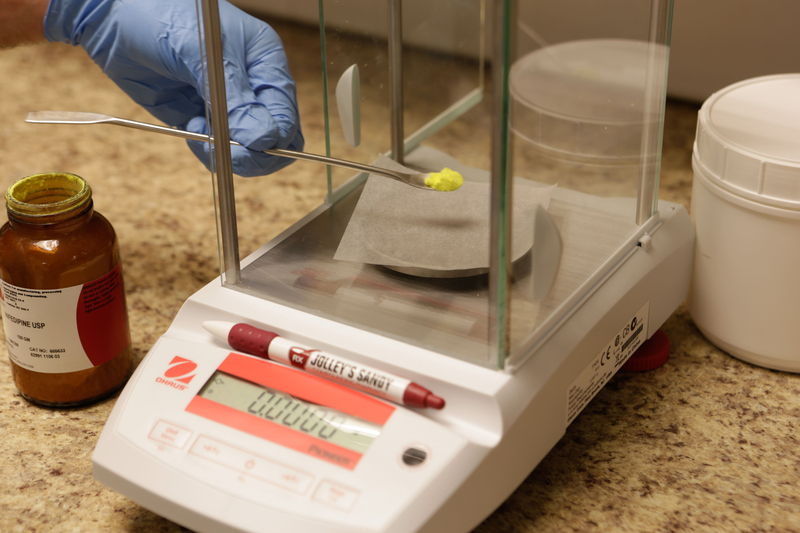 We use the highest quality compounding materials available. We are so glad to be a part of the community and appreciate the opportunity to help our friends and neighbors enjoy good health. Whether you’re a patient or a doctor with questions, please contact us. Troy, Randy and Daniel, our pharmacists, or any of our friendly staff, would be happy to talk with you.